Since history of past injury is a predictor of subsequent injury, the decisions around when a player should return to play are difficult.1–3 It is difficult for a clinician to find the right balance between returning a player too early and the player suffering a recurrence, or delaying return to play so the team has few available players. Much has been written on the politics of who should make the decision4 and within those arguments, a comprehensive checklist of considerations has been developed.5 ,6 In their review of 148 papers on the subject of return to play, Matheson et al7 developed a three-tiered decision-making process which has been recently clarified in the Strategic Assessment of Risk and Risk Tolerance (StARRT) framework8 (see table 1). The first step outlines the medical factors associated with the injury to ascertain the level of injury risk with returning to play. Step 2 predominantly focuses on the player or sport factors that may mitigate or augment the risk of reinjury (eg, an American Football quarterback may be at greater risk of exacerbating a shoulder injury than a place kicker). The third step focuses on the factors associated with whether the final ascertained risk is worth taking within the confines of the needs of the coach, team, athlete and medical service provider. While steps 2 and 3 are extremely important in the final decision, we confine our discussion to step 1 in the initial evaluation of the risk of reinjury. Compliance with federal, state, local and governing body regulations and legislations. Communication with family, trainers, coaches, etc. We confine our discussion to the first three points of the final checklist: the restoration of sports-specific skills and function and the restoration of the musculoskeletal, cardiopulmonary and psychological systems of the athlete and, in particular, how they are assessed. We believe a critical aspect that has been excluded from the return to play decision relates to the amount of training the athlete has completed over the time of the recuperation in order to be adequately prepared for the demands of the game. Both of the previously mentioned protocols (the three-step decision model and the return to sport checklist)6 ,7 refer to medical history and ‘functional tests’ but do not specify the training history compared with the demands of full training and competition. Functional tests come in a myriad of forms. If we specifically examine tests for lower limb injuries, they could include timed runs, vertical jumps, hop tests and the star excursion balance test (to name a few). This form of testing may provide an indication of the athlete's ability to perform a single task (eg, run 40 m in a given time). Although the functional test has some clinical utility in evaluating the rehabilitation progress of an athlete, these tests do not predict injury.9 ,10 Among 23 physical performance measures, only the star excursion balance test had any injury predictive ability.9 ,10 These tests can rule a player out of competition (ie, if the athlete cannot hop, they probably cannot play basketball), but they are only a milestone on the return to play path (ie, athlete can hop, but it is still unclear whether they are prepared for full training and competition). Functional tests provide little insight as to how the athlete will withstand the rigours of full training and competition. Recently, we have quantified cricket fast bowler's workload using both external load (ie, balls bowled) and internal load (time (mins) X rating of perceived exertion, RPE). We also quantified external load (ie, distance run) in rugby league and Australian football players. These data were then modelled comparing the acute load (ie, the training that had been performed in the current week) with the chronic load (ie, the training that had been performed as a rolling average over the previous 4 weeks). This model, initially proposed by Banister and colleagues11 ,12 and more often using the terminology of “fatigue” (acute load) and “fitness” (chronic load) has been used previously in performance studies13 but not in studies of the relationship between workloads and injury. The size of the acute load in relation to the chronic load provides a ratio score referred to as the acute-chronic workload ratio (also commonly referred to as the “training-stress balance”). An acute:chronic workload ratio of 0.5 would suggest that an athlete trained or completed only half as much of the workload in the most recent week as what he/she had prepared for over the past 4 weeks. An acute:chronic workload ratio of 2.0 suggests that the athlete performed twice as much of the workload in the current week as what he/she had prepared for over the previous 4 weeks. We define ‘spikes’ in training and playing load as periods where a player has an acute:chronic workload ratio of >1.5. While this appears to be the point at which injury risk starts to rise, the balance between performance enhancement and injury risk must also be considered. Spikes predict subsequent injury in cricket fast bowlers,14 professional rugby league players15 and professional Australian Football players. When considering the acute:chronic workload ratio, clinicians should realise that normal training should include ratios above 1.0 when the athlete is increasing his/her training load; how far above 1.0 and for how long will influence injury risk. As with any ratio, a large number can be driven by a large numerator or a small denominator. In this case, that would reflect a (relatively) large acute workload or a (relatively) small chronic workload. We have seen injury follow scenarios where an athlete has undergone significant loading in a single week (large numerator). 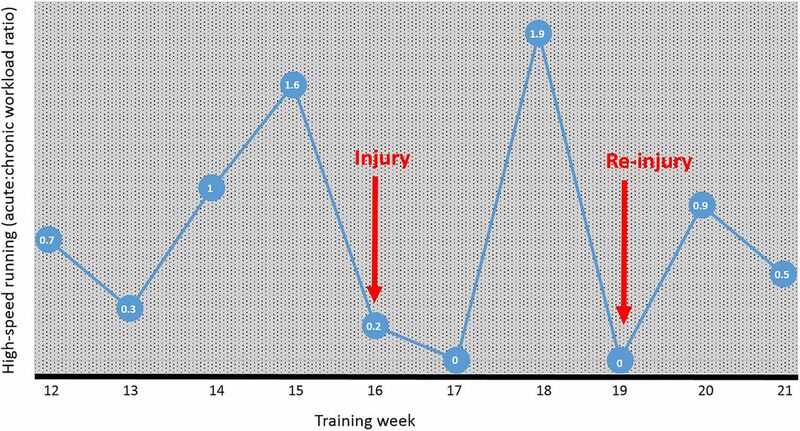 We have also noted circumstance where the training load has decreased over the past 4 weeks (small denominator) and a player has suffered injury with what seemed like a ‘normal’ acute workload. Causes of lower chronic workload can include injury or illness, significant sponsor commitments or suspension from playing with inadequate ‘make up’ workload. The example of balls bowled in cricket fast bowlers is perhaps the most easily understood, particularly given that when playing long form cricket, a large component of a player's load occurs during match play.16 We can assume that if a fast bowler enters a long form (4–5 day) cricket match, they will (on average) be required to bowl approximately 240 balls during the match.17 On the basis of these requirements and using data we have presented previously,13 if a bowler returning from injury has a chronic bowling load of 120 balls per week, they will incur an acute:chronic workload ratio of 2.0 with their likelihood of injury in the following week at ∼12%. When considering that the baseline injury likelihood is approximately 4%, this constitutes a relative risk that represents a 3.0 times greater prospect of injury. However, if their chronic load was 180 balls per week, their likelihood of injury is reduced to approximately 5% (a relative risk of 1.25). A further ‘real-world’ example is provided from the training load history of an elite rugby league player who had sustained a recurrence/exacerbation of a grade 2 hamstring strain. During early stage rehabilitation (∼2 weeks), the intensity of high-speed running performed was <1.0 m/min (ie, ∼30 m of high-speed running in a 30 min session). From the second to third week of rehabilitation, the player's high-speed running load was increased to 25.0 m/min (ie, ∼750 m in a 30 min session). Subsequently, the player suffered a recurrence of the hamstring strain (a graphical representation can be seen in figure 1). In this example, several training load factors most likely contributed to the injury recurrence. First, it was highly likely that the ‘spike’ in training loads from week to week considerably increased the risk of injury. Second, although the applied training load was specific to the most extreme demands of competition (see table 2), they also grossly exceeded the load for which the player was prepared. A graphical representation of the high-speed running loads of a rugby league player who after a week of acute:chronic workload ratio of 1.6 suffered a hamstring injury and then subsequently in the rehabilitation phase experienced an acute:chronic workload ratio of 1.9 which led to reinjury. To further illustrate the value of modelling acute and chronic loads in the return to play process, we would like to present a collapsed version of our research in this area. This representation is illustrative only, and should only be considered a guide to how the acute and chronic loads of athletes can be manipulated to minimise the risk of injury. Figure 2 depicts training load data from studies of three different sports (cricket, rugby league and Australian football). In the original papers, the acute:chronic workload ratio was presented as a range and the likelihood of injury as an absolute figure. For our purposes, we have taken either: (1) The mid-point of the acute:chronic workload ratio range (ie, 0.5 −1.0 becomes 0.75, as our acute:chronic workload ratio score). Or (2) In the case of the end-point ranges, that is, 0.0 −0.5 or >2.0, the acute:chronic workload ratio has been entered as 0.5 or 2.0. We have included the internal (balls bowled) and external (session RPE=minutes×self-reported exertion) load measures from the cricket paper,14 the total running load data from the rugby league paper15 (but have excluded the data taken on very high training loads as an athlete who has been injured is unlikely to have a high training load) and the total running load and high-speed running load from the Australian football paper. The acute:chronic workload ratio and subsequent injury likelihood from studies of three different sports. The fitted polynomial line (±95% CIs) has an R2=0.53 and the equation: likelihood of subsequent injury=9.98 acute:chronic workload ratio2–18.42 acute:chronic workload ratio+11.73. This equation can allow us to approximate the injury likelihood for any given acute:chronic workload ratio. A second-order polynomial curve was fit to the data. This regression equation demonstrates that 53% of the variance in the likelihood of injury in the following week can be explained by the acute:chronic workload ratio (a linear model only explains 34%). If we then apply the equation for the line to a number of different combinations of acute and chronic loads, we can estimate the risk of injury on return to sport associated with a given acute:chronic workload ratio (see table 3). We present a range of chronic workloads to represent longer times of inactivity or rehabilitation. The range of acute workloads is provided to demonstrate a range of scenarios (eg, an athlete on restricted training and only playing as a substitute in the return to play match (60%) through to the most demanding match (120%)). Below is an example of a football player who suffered a grade 2 hamstring injury and missed three matches (see figure 3). A representation of an injured player's return to play with possible injury likelihoods given the different scenarios of the demands on return. It shows that as the athlete progresses through their rehabilitation phase (weeks 4–7), their chronic load starts to ebb away to be around 57% of a normal week by the end of week 7. 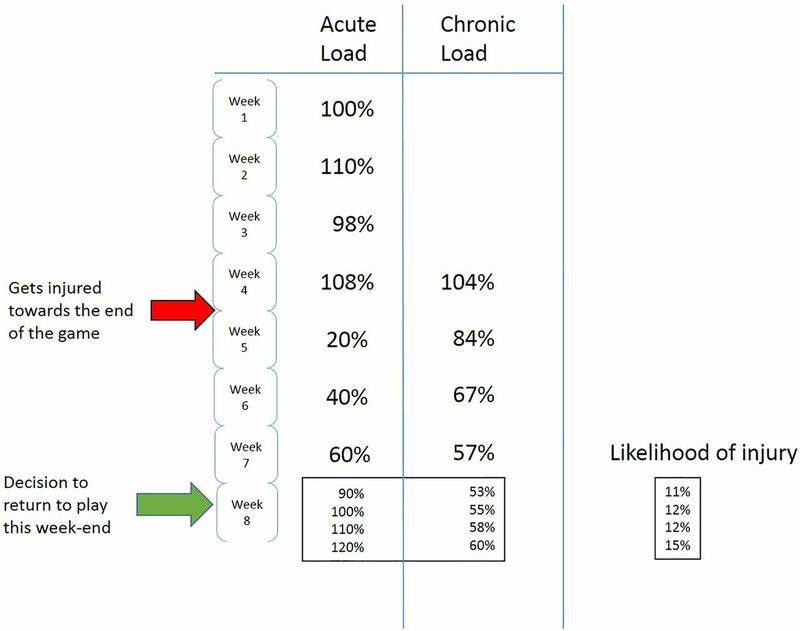 Once the decision of ‘return to play’ is made at this time with the possibility of 90–120% of average load in week 8, the acute:chronic workload ratio will be between 1.7 and 2.0 with injury likelihoods of 11–15%. If the decision to return to play is made during week 8, with possible variations in the training and play that week (90–120% of a ‘normal’ week), the player will return with a risk of injury of between 11% and 15% (which may be entirely acceptable). However, if left another week with an estimated training load of 80% in week 8 and return to play in week 9 (with 90–120% load of a ‘normal’ week), the injury risk decreases to 5–8%. There are a number of points of debate within this discussion. As previously mentioned, the collapse of our load and injury risk data is for illustrative purposes, and each type of loading for different sports will most likely require its own specific model. However, this modelling clearly demonstrates that if athletes perform greater workloads than they are prepared for, they are more likely to sustain an injury. Also, our studies14–15 captured ‘all injuries’ and do not specify risk of particular injuries, that is, bone, soft tissue. In cricket fast bowlers, different acute and chronic loading histories have either protective or causal relationships with different types of injuries.16 Studies with larger sample sizes and specific injury types will further our understanding. What is the better measure of workload? In our fast bowling study,14 the internal load (session minutes×self-reported RPE) data were more sensitive to subsequent injury than the external load (balls bowled). However, at no stage would we recommend that fast bowlers should measure their workload exclusively using internal load measures. While 120 min of fielding training at an RPE of 6 (120×6=720 exertional minutes) is the same internal load as 90 min of bowling training at an RPE of 8 (90×8=720), the bowling training better prepares the player for bowling than does the fielding training. We believe that the increased sensitivity of the internal load data came partly from having a more complete picture of the total training load, and also the added value of how the athlete is responding to the load. Next, let us consider running load data. Hamstring injuries are associated with high-speed running.18 If, in the return to play phase, only total running volume is monitored, the player could return to 100% of total running volume but have 0% of required high-speed running volume. We suggest that the volume of high-speed running plus total running load expected in a normal week should be the major measures of the workload in this example. However, as previously noted, the acute:chronic workload ratio can be calculated for any variable deemed relevant to the practitioner (eg, collisions, accelerations, decelerations) as it is the comparison of what is done with what is prepared for that is critical. We acknowledge the strong probability that other factors such as age, training history and injury history will shift the relationship between the acute:chronic workload ratio and injury risk curve up or down.16 As with any modelling, the model will become more accurate with more data over time and may be specific to the players who provided the data. This will benefit a team that retains a core of players and fitness coaches over a number of years (as many successful teams do) as they should have a rather precise estimate of risk relative to training loads While this model may be refined in future studies, the foundation of the model—that athletes need to be prepared for what they are asked to do—is very solid. In conclusion, we are under no illusions that the return to play decision is simple. Any athlete competing is at a risk of injury and that risk is multifactorial. We believe that trying to quantify that risk will allow for more informed decisions and lower reinjury rates. In previous literature, the measurement of the training load of an athlete relative to the demands of competition has not been clearly articulated as a consideration in the return to play decision. The acute:chronic workload ratio should be included in the return to play decision-making process.
. 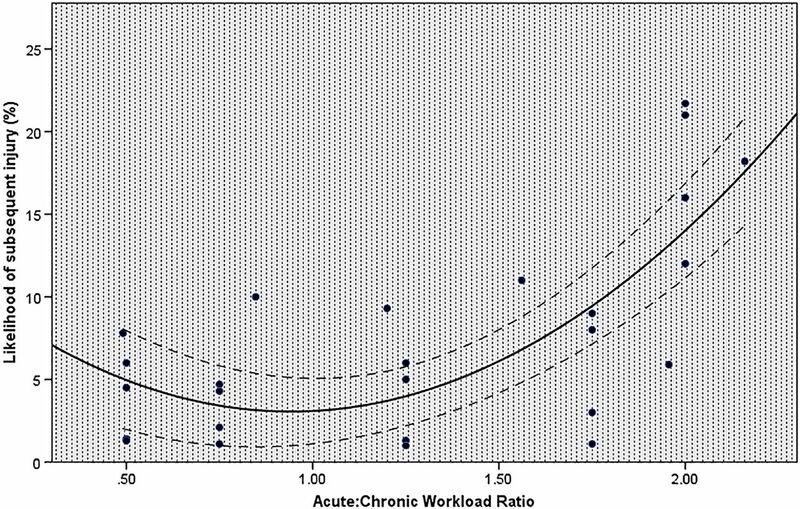 The acute:chronic workload ratio predicts injury: high chronic workload may decrease injury risk in elite rugby league players. Br J Sports Med 2016;50:2316.
. Cricket fast bowling workload patterns as risk factors for tendon, muscle, bone and joint injuries. Br J Sports Med 2015;bjsports-2015-094869. Correction notice This paper has been amended since it was published Online First. In the figure 2 legend there was an error. The number 9.78 has been corrected to 9.98. Competing interests PB used to be employed by Cricket Australia and is now currently employed by Essendon Football Club.